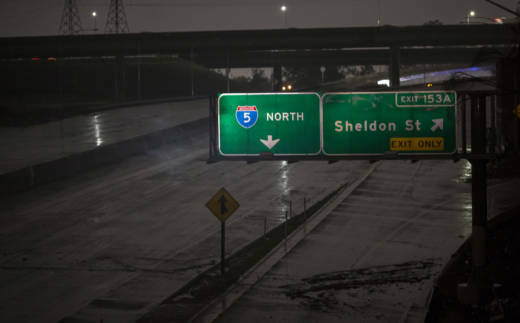 LOS ANGELES — A huge Pacific storm that parked itself over Southern California and unloaded, ravaging roads, opening sinkholes and leading to the deaths of at least two people, eased off Saturday but it was only a temporary reprieve as new storms took aim farther north. The National Weather Service predicted drying weather through Sunday followed by the return of wet weather in the region. But while flash flood watches for Southern California were canceled, Northern California and the San Francisco Bay Area were facing a weekend return of heavy rain and winds that lashed them earlier in the week before the storm moves out. "Stronger southerly winds and widespread flooding will be likely as an atmospheric river (of moisture) takes aim somewhere along the central California Coast," a weather statement warned. The approaching rain could cause more problems in the far north where damage to spillways of the Lake Oroville dam forced evacuation of 188,000 people last weekend. As of Saturday, the lake's water elevation had fallen more than 45 feet. Meanwhile, authorities up and down the state were dealing with the fallout, including overflowing creeks, mudslide threats in foothill areas denuded by previous fires, road collapses and hundreds of toppled trees in neighborhoods. Northwest of Sacramento, nearly 200 people were evacuated Saturday as overflowing creeks turned the town of Maxwell into a brown pond. Fire Chief Kenny Cohen said nearly 100 homes and the elementary school filled with a couple inches of water before the water began receding. Southern California appeared to dodge any major disasters, but in the desert town of Victorville, several cars were washed down a flooded street, and one man was found dead in a submerged vehicle after others were rescued, San Bernardino County fire spokesman Eric Sherwin said. And in the Sherman Oaks area of Los Angeles, a man was electrocuted when a tree falling in heavy rain downed power lines that hit his car. Later in nearby Studio City, a sinkhole swallowed two cars, the second on live TV as viewers watched it teeter on the edge before plunging in. Firefighters rescued one person from the first car, and the driver got out of the second before it fell. One driver was taken to the hospital in fair condition. Inland at the Cajon Pass, the shoulder of Interstate 15 crumbled and sent a parked firetruck spilling over the side, but no one was hurt. The California Department of Transportation estimated emergency repairs to the freeway would cost $3 million. In Thousand Oaks, north of Los Angeles, the search continued Saturday for a man who reportedly was swept away in a flooded gully on Friday. Three other people stranded by the water were rescued. AP writers John Antczak and Mike Balsamo contributed to this report.